Liverpool’s property professionals pitched together at this year’s Cannes Do event to raise more than £8000 for Liverpool Charity, Down Syndrome Liverpool. During this year’s event £8251.75 was raised for the charity which supports parents, carers and families who are affected by Down Syndrome while seeking to enhance the lives of people with the condition who live in Liverpool and the surrounding area. Down Syndrome Liverpool (DSL) is based in the City of Liverpool and has almost 200 members. Run solely by parents and carer Trustees of people with Down’s syndrome and has been in existence in its present form since 2003. 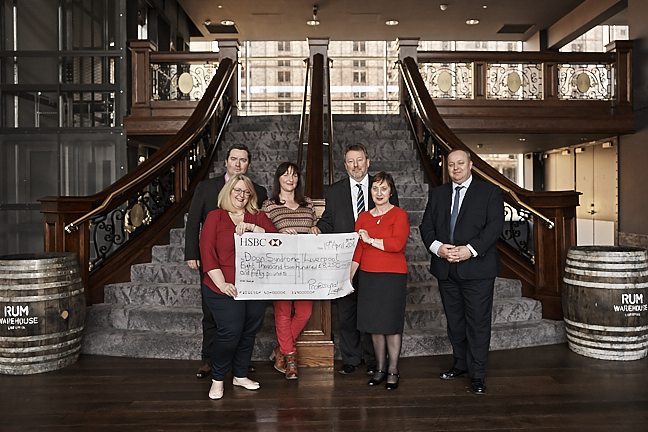 At the Rum Warehouse, a donation cheque was presented by Andrew Lovelady, Professional Liverpool finance director and board member to representatives from Down Syndrome Liverpool, Ana Gilmurray, Margaret Hogan and Susan Hynes. Margaret Hogan, treasurer of Down Syndrome Liverpool, said: “We would like to say a huge thank you to Professional Liverpool for making us its chosen charity at this year’s Cannes Do event and to each and every person who donated at the event.